It’s possible that you may be able to take some of your moving expenses as a tax deduction. Even though government regulations are stricter now than in the past, you still may have an opportunity to catch a break if you meet following criteria listed below. 1. You have a new job or job transfer that is at least 50 miles farther from your new home than your previous home. 2. Your new home is at least 50 miles from your old house. 3. Moving will make your commute shorter to work. 4. You’re a member of the armed forces and had a permanent change of station. 5. If you’re working full-time—even if self-employed. 6. If you incur expenses within one year from when you started a new job. 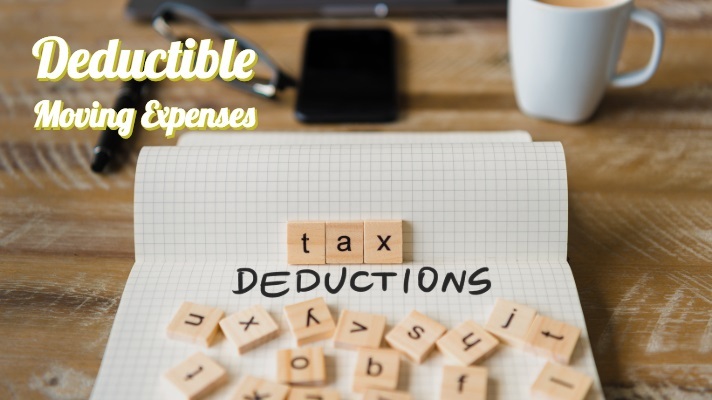 Expenses are typically deducted from your adjusted gross income instead of being included in your itemized deductions. You may then take the standard deduction, if it works to your advantage. What Are The Qualified Tax Deductions? 6. Transportation and lodging for you and members of your household while traveling to your new home. These items are not allowable any longer : $3,000+ for up to 30 days of temporary living expenses, home searching, trips and your cost of selling your old home and buying a new one. If your employer covers the cost of your move, the amount of qualified moving expenses are excluded from your taxable income and should be noted with a code P in box 12 of your W-2. However, if the employer pays the cost of the items (temporary living expenses, house hunting trips, costs of selling a house), those amounts must be included in your taxable income. To write off your relocation costs, you must use the long Form. You don’t need to itemize any other deductions. The costs are detailed on Form 3903 and the total transferred to line 27 of your return. You don’t need to complete Schedule A, meet any percentage-of-income thresholds, or deduction phase-outs. It’s important to remember that with the rapidly changing tax codes, it is always recommended that you consult your tax accountant to inquire about all deductible expenses. You may be pleasantly surprised if you do meet some of the requirements outlined above.